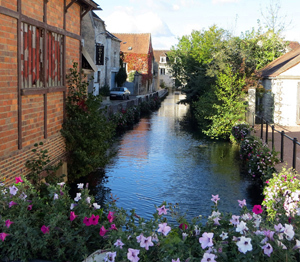 I’ve been extolling the virtues of Dry Rose’ since writing this blog. I keep finding new wines that excite me that scare people away. If’ it’s called Rose, folks, or if it is pink — it is NOT a bad thing. White Zinfandel, that of the pinkish hue, is enough to frighten anyone. But great dry Rose’ is as far away from White Zinfandel as one can get. Dry Rose’ is enjoyed in the summer months. Many red wine drinkers find it more satisfying than white but still not quite the powerhouse of many reds. Tuesday night I opened a Chateau de Pena – or Cuvee de Pena 2010 Rose. The wine is 60 percent Grenache and 40 percent Syrah. It’s full flavored with a light touch. You’ll get a little hint of strawberry, and maybe melon. What you will remember is how easy it is to drink and enjoy. Don’t be afraid to try Rose’ with food. It will hold up to many lighter meals. 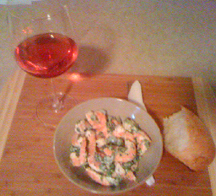 Tonight I had some wonderfully simple Shrimp salad I picked up at an upper-scale market in Indianapolis. There was a very light dressing on fresh shrimp with herbs. I added a hunk of crusty bread and couldn’t have been happier. Oh, by the way did I mention this wine can be found around the $10 price point? 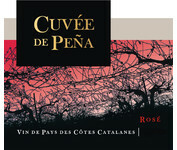 For those that find it important, the Cuve de Pena Rose comes from the Languedoc-Roussillon region of France. It’s just delightful. I’d give this wine a Highly Recommended!